"The I.W.W. and the other features that go with it." During World War I, government at all levels subjected the Industrial Workers of the World (IWW), a radical labor union, to repression in the name of wartime security. IWW organizers were repeatedly arrested, and strikers were beaten or shot by police and hired thugs. In September, 1917, federal agents raided every IWW office in the country, arresting some 300 leaders on charges of espionage and sedition. Within six months, two thousand IWW members, known as Wobblies, were in jail and awaiting trial. Most were eventually convicted of violating wartime statutes and sentenced to long prison terms. The organization never recovered from these wartime setbacks. 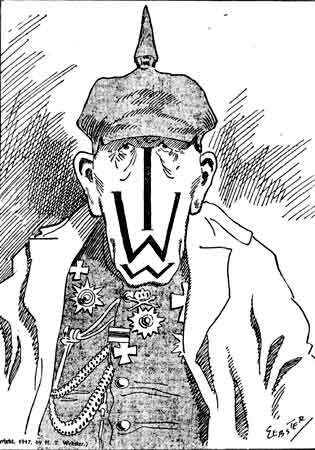 This 1917 cartoon from the New York Globe newspaper uses the acronym “IWW” in place of the features of Kaiser Wilhelm of Germany, visually accusing the Wobblies of treason. Source: Harold Tucker Webster, Cartoon Magazine, September 1917—Prints and Photographs Division, Library of Congress.